The Wolds Trophy meeting at Cadwell Park this weekend (May 19/20) is the next event in the Historic Sports Car Club's 2018 race programme. The spectacular three-dimensional Lincolnshire track sits in a glorious parkland setting and will play host to an annual visit from the HSCC for 22 races over two days, many featuring bumper grids. 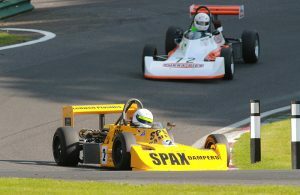 Over 220 cars, covering single-seaters, sports cars and touring cars will head to Cadwell Park. The two most enduring junior single-seater categories from 13 years of racing between 1958 and 1971 continue to thrive as four races run for both Formula Junior and Historic Formula Ford 1600. The Formula Junior pack will be contesting the second event in the final UK leg of the category's Diamond Jubilee World Tour and there will be double-headers for both front-engined and rear-engined grids. The races are also rounds of the HSCC/FJHRA Silverline Historic Formula Junior Championship. Stuart Roach, who has an enviable record at Cadwell Park, heads the front-engined field in his Condor S2 but faces a gaggle of challengers including the pair of Bonds for Andrew Tart and Mike Walker. Ray Mallock (U2 Mk2) has had a superb run in the World Tour and will be right on the pace, as will his Donington rival Chris Drake (Terrier Mk4). A dark horse could be Jonathon Hughes in another Terrier Mk4. After a commanding double win last time out at Donington Park, Lincoln-based Cameron Jackson (Brabham BT2) will be the benchmark in the rear-engined grid, with rivals set to include Westie Mitchell (De Tomaso) and reigning champion Peter De La Roche (Lola Mk3). Jackson will also be a leading player in the Historic Formula Ford Championship, which features four races to ensure that all the drivers get to race at least twice. Jackson's Lola T200 will renew the sensational Donington battles with current champion Richard Tarling (Jamun T2), Benn Simms (Jomo JMR7), Ben Mitchell (Merlyn Mk20), Callum Grant (Merlyn Mk20), Nelson Rowe (Crossle 20F) and Max Bartell (Merlyn Mk20). The fourth round of the 70s Road Sports Championship features another superb grid, headed by the Datsun 240Z of Charles Barter and double Snetterton winner Jeremy Clark (Lotus Elan). Clark heads a nine-strong squadron of Lotuses, including two Elans, two Seven S4s and no less than five Europas. To accommodate all the 70s field, the cars in the invitation class will share a grid with the Historic Touring Cars. Not to be outdone by its younger brother, the Historic Road Sports Championship has also assembled a fine field capped by the Morgan Plus 8s of Bruce Stapleton, Richard Plant and Kevin Kivlochan. The twists and turns of Cadwell are not ideally suited to the mighty Morgans and Lotus Elan racer John Davison will be hoping to inflict another defeat on the V8 pack. Another over-flowing entry will gather for two rounds of the Historic Formula Ford 2000 Championship, with reserves waiting to get a place on the grid. With Donington winner Andrew Park absent, former champions Benn Simms and Nelson Rowe should be the pacesetters. Both Simms and Rowe are in for busy weekends running two cars in four races and both will, as usual, rely on the support of their hard-working fathers to make it all happen. Meanwhile, the very rapid Ian Pearson will make his 2018 championship debut and has his father Bob on the grid in their pair of Royale RP30s. The HSCC Historic Formula 3 Championship will bring the awesome 1-litre F3 cars to Cadwell Park, a track that hosted these cars nearly 50 years ago. The weekend's races are, as usual, for the Justin Haler Memorial Trophy and European visitors Francois Derossi and Christoph Widmer will take on Steve Smith (Chevron B15) and Jonathon Hughes (Merlyn Mk14a). Jonathan Lewis (Mini Cooper) will go up against the Lotus Cortinas of Richard Belcher and Roger Stanford in the Historic Touring Car double-header, while Mark Charteris, John Harrison and Adrian Holey head the Classic Clubmans field. Wrapping up the weekend are two races for the Lackford Engineering Sprite and Midget Challenge.